This external CD/DVD drive is a perfect companion for computers without the internal drive. You can watch DVD movies, listen CD music, copy music, pictures, movies to a CD/DVD, install software, or create backup discs etc. -Interface: USB3.0 for faster speed. 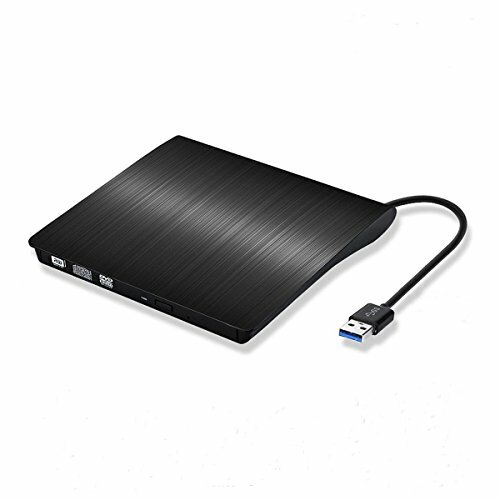 (Also compatible with USB 2.0/1.0) USB 3.0 CD drive provide high data transfer speed up to 5Gbps. -Systems Supported: Windows 98/SE/ME/2000/XP/Vista/Win 7/Win 8/Win 10/ Windows Server 2008, 2012/Linux/Mac OS System etc. -Plug & Play: Easy to use and no external driver and power needed. 1. The new released Windows system have discontinued the internal DVD media player software, customer using Windows 10 and above are advised to Install VLC Media player to Play DVD and CD. 2. Some external devices require sufficient power supply to operate properly, so make sure your laptop to be plugged in to power cord or use a powered USB hub on the notebook. 【EASY TO INSTALL & USE】 - Plug and play. This external CD/DVD Drive is equipped with USB 3.0 high speed interface, bringing you faster data transmission speed (up to a maximum of 5Gbps) No need any driver and extra power supply. Just plug into the USB port directly on laptops or computers with Windows XP / 2003 / Vista / 7 / 8.1 / 10, Linux and Mac 10.10.4 OS, normally it will be recognized automatically. 【Multi - Function】It's not only a CD/ DVD reader, but also writer / rewriter / burner for your computers. Allow you to watch movies, listen to music, create backup disc, install software or burn music disc. Support CD-R, CD-ROM, CD+/-RW, DVD-ROM, DVD-R, DVD+/-RW, DVD-R DL, VCD discs. This external DVD drive equipped with brand new chip with strong error-correction ability, plays music and movies with no lag or distortion. 【Fashion & Ultra Slim Design】 Brushed texture shell brings touch and sight enjoyment. Lightweight body makes it easy to carry anywhere. 【PORTABLE ASSISTANT】Slim compact design bringing you rich audio-visual entertainment, efficient office and learning with your one or more laptop at anytime anywhere, no matter at home, in office or on a trip. 【Service Guarantee】Brand new DVD loader with 365days Risk-Free Warranty and Free Lifetime Tech Support. Support replacement or inquiry with 24 hours friendly customer service. If you have any questions about this product by Baijixin, contact us by completing and submitting the form below. If you are looking for a specif part number, please include it with your message.